The 1980s was a tough decade for Robert Altman. After enjoying so much creative freedom in the 1970s it all came crashing down with Popeye (1980), a big budget adaptation of the comic strip of the same name. It was plagued with production problems and failed to perform at the box office as well as the studio had hoped thereby exiling Altman from Hollywood after burning the last of his bridges. The maverick filmmaker continued to work, adapting plays into films (Fool for Love) and working in Europe (Beyond Therapy). When he was handed the screenplay for The Player (1992), one could see Altman looking at the project as an opportunity to bite the hand that once fed him. Michael Tolkin’s script took an acidic, insider’s look at the studio culture within Hollywood. The film was a hit, particularly in Europe, and received several awards. More importantly, it gave Altman’s career a much-welcome jolt, kickstarting a prolific run of films in the 1990s. Altman establishes a playful tone right from the get-go as his camera follows several characters on a busy studio lot in a single, uninterrupted take a la the opening scene of Orson Welles’ Touch of Evil (1958) and even has the cheek to have one of his characters reference said scene during this sequence. It sets a satirical tone as we eavesdrop, Altman-style, on a several movie pitches, including Buck Henry’s idea for a sequel to The Graduate (1967) and another one that is pitched as Out of Africa (1985) meets Pretty Woman (1990) starring Goldie Hawn (or Julia Roberts). Studio executive Griffin Mill (Robbins) is on the receiving end of these pitches but he’s preoccupied by how easily a screenwriter got on the lot and ambushed him with his own movie pitch. It foreshadows a series of threatening postcards Griffin receives that make him very paranoid, which only adds to the usual amount he experiences on a daily basis as execs like him are only as good as their last successful movie and he’s feeling the pressure, especially when up-and-coming exec Larry Levy (Gallagher) arrives at the studio full of fresh ideas. The rest of the film follows Griffin’s attempt to track down the source of the postcards while trying to save his job. 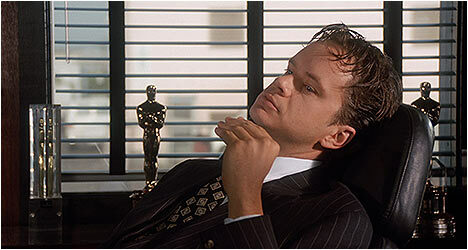 Tim Robbins does an excellent job of portraying a soulless studio executive who becomes increasingly paranoid. The actor nails his character’s sweaty desperation and is unafraid to play an unlikable character that is still intriguing enough to watch and see what happens to him. He’s supported by a staggering cast of actors from the likes of Fred Ward and Jeremy Piven to Cynthia Stevenson and Whoopi Goldberg – all of whom flesh out the darkly humorous world that Altman has created. These actors are, in turn, supported by a bevy of cameos by actors, directors and writers playing satirical versions of themselves. Their appearances are sprinkled lightly throughout the film, mostly as background detail, adding to the insider Hollywood vibe of the film. By Altman’s own admission, The Player isn’t a vicious attack on Tinseltown but rather a playful jab at how it works and the people that populate it made by someone with first hand knowledge and experience. At times, it is very funny, especially the insider stuff, but it also goes to dark places like when Griffin is forced to confront his true self and finds out just how far he’s willing to go to preserve his lifestyle. This Blu-Ray transfer differs from the previous one released by the studio and Criterion have done it again by presenting The Player with more detail and warmth to the image than previously seen. It looks fantastic! There is an audio commentary from 1992 by director Robert Altman, writer Michael Tolkin and cinematographer Jean Lepine. The Player was the culmination of six years Tolkin spent trying to make it in Hollywood and his frustrations with trying to be a cross between Rainer Fassbinder and Steven Spielberg. Lepine points out that Altman didn’t give him specific direction and allowed him to express himself. Altman talks about why he cast Tim Robbins and touches upon his approach to filmmaking at various points. “Planned Improvisation” is a featurette with new interviews with Robbins, Tolkin, production designer Stephen Altman, and associate producer David Levy. Tolkin talks about the origins of The Player and how he got the initial idea for it. Altman says that he was inspired by the look of Stephen Frears’ adaptation of The Grifters (1990) and its mix of styles. Robbins was originally approached for Short Cuts (1993) but the financing didn’t come through and so they did The Player first. There is a 1992 interview with Altman where he talks about how The Player is a film about movies and draws attention to itself as a movie. He explains how he used techniques from various genres to draw attention to itself as a film. There is some overlap from the commentary. “Cannes Press Conference” features Altman, Robbins, Tolkin and actors Whoopi Goldberg, Brion James, and Dina Merrill as well as key crew members. It’s a spirited affair as you would expect from Altman and his collaborators as they talk about the film. “Robert Altman’s Players” is a making of featurette about the celebrity fund-raiser scene in which an actual event was held with some of the cast mixing it up with actual celebrities. We get plenty of fascinating behind-the-scenes footage. “Map to the Stars” is a gallery of all the celebrity cameos in the film. Also included are five deleted scenes and outtakes from the Lonely Room scene within the film starring Scott Glenn and Lily Tomlin. Two scenes feature additional cameos by Jeff Daniels and Patrick Swayze respectively. The opening eight-minute shot is presented with commentary by either Altman or Tolkin and Lepine. Finally, there are U.S. and Japanese trailers and several T.V. spots.